After his one-album deal with Brunswick Records in the late 60s, Percy Mayfield found himself signed to RCA Victor in 1970. 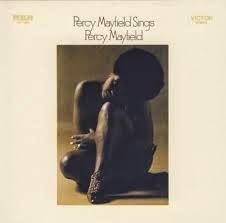 His first album on his new label, Percy Mayfield Sings Percy Mayfield, was an excellent release - effortlessly cool with its smoky, lazy blues vibes. The twelve original songs were as clever and insightful lyrically as his songwriting had always been, and they were strengthened by some splendid arrangements courtesy of Joe Jones. One of the songs, "To Live The Past", actually scraped into the R&B singles chart, peaking at #43. It wasn't exactly a true comeback, but obviously there was still a market for his style of R&B. Not related to this exact post, but just wanted to say thanks for all the work you do on your blog. Time and time again, I've found myself here (Google always leads me back, just by happenstance), and I am always pleased by the new stuff you help me discover. Anyway, great posts, and great taste in music. Keep up the good work! Thanks so much, cool stuff!